A Prize-winning quilter, Joyce R. Becker focuses her art, writing, teaching and lecturing on landscape quilts. Joyce’s books, Quick Little Landscape Quilts, Beautifully Embellished Quilts, and Luscious Landscapes were published by C&T Publishing. Joyce’s DVD, Joyce Becker Teaches You Landscape Quilting, is informative, educational and entertaining. Joyce has made appearances on: QUILTING ARTS TELEVISION with Susan Bruebaker Knapp, The Quilt Show with Ricky Tims and Alex Anderson, Simply Quilts with Alex Anderson, and M’Liss’s World of Quilts. She was also featured on a promotional DVD for the Tsukineko Company. 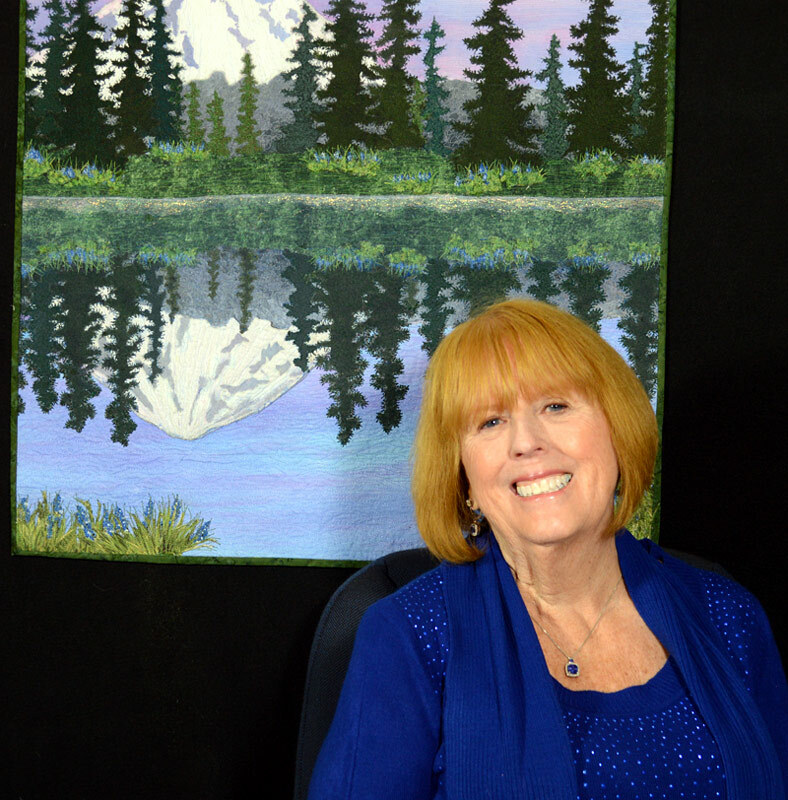 Joyce was a founding board member of the Association of Pacific Northwest Quilters and has volunteered throughout her region. Her quilts have been displayed internationally in contests and invitational exhibits and have appeared in books, magazines, and on television. Joyce’s works has been featured in many mainstream quilting magazines, including Quilting Arts Magazine. Joyce’s lively sense of humor and positive attitude has resulted in lectures and workshops that inspire, inform, and entertain quilters throughout the world. Joyce has enjoyed teaching on cruises with Quilt Camp at Sea including: a cruise through the Panama Canal, Mexico, Alaska, and the New England coast. She has taught and lectured throughout the United States for guilds and large conferences, including the International Quilt Festival in Houston, Texas, Empty Spools conference in California, and conferences in Canada and New Zealand. She was a Featured Artist at Quilt Expo in Portland, Oregon in 2016. Quilting and writing have changed my life. Never in my wildest dreams did I think I would end up as a professional landscape quilt artist and author. For me, it has never been about fame or fortune but always about the joy of giving back to something that has blessed me in so many ways. Watching the spark of creativity come alive in quilters who thought they could never design and create a landscape quilt is what makes my spirit fill with happiness and joy. To all of you have written me from all over the world thanking me for writing my books and helping you with your creations, it has been my pleasure. With time, comes change. Due to some physical limitations following rotator cuff surgery on my right shoulder, I have to consider future bookings case by case. Please E-mail so we can discuss options. While recovering from surgery, I was unable to quilt, but I could write, so I wrote the first in a series of three quilting novels. I am waiting now to hear back from my publisher to see if they will accept my novel for publication! I’ve also created a quilt as the possible cover of my first novel and the quilt is titled: Mt. Rainier Reflecting in Tipsoo Lake. It’s in my gallery of quilts in the Majestic Mountains category, so take a peek! 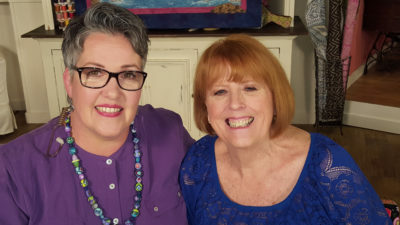 BIG NEWS: I’VE BEEN A GUEST ON THE PBS SERIES, QUILTING ARTS, WITH HOST SUSAN BRUEBAKER KNAPP. SERIES 2100 that aired in 2018! I APPEARED ON EPISODES 3, 7, AND 12! MY BLOG: Even though I try to keep current on my blog, I’m afraid I’m not as punctual as I should be. Please take a look at my blog, though because I do have a couple of videos showing techniques and other important information. I will try my best to keep it more current in the future. Please feel free to e-mail me if you have questions or comments about me or my blog or questions regarding creating landscape quilts. See Contact page. Drawing on my life-long love of nature, my prize-winning landscape quilts encompass a variety of surface design techniques imparting realism. While researching my book, Nature’s Patterns, published by the Quilt Digest Press in 1996, I realized how much I love nature and instead of using traditional methods, it was my desire to create techniques that resulted in original, realistic landscape quilts. I study nature as though I am looking through the lens of a camera, setting up possible landscape scenes in my mind for future reference. My inspirations come from many sources including; photographs, snapshots of gorgeous scenes when I travel that I store in my brain, greeting cards, photography books, calendars, and impressionistic artist, Claude Monet. The most important part of creating landscape quilts is to create the correct perspective through the use of value and scale: lighter and smaller in the distance and larger and darker in the foreground. My art is accomplished using many surface design techniques including : my original “cut and glue” technique of raw edge machine appliqué, textile painting, stamping, sponging, dyeing, extensive machine embroidery and thread-work, three-dimensional bonding, as well as overlays of tulle and polyester organza for shading and depth. Each landscape is completed using free-motion machine quilting that compliments the design and marries the three-layers together into a cohesive piece. My books, Quick Little Landscape Quilts, Beautifully Embellished Landscape & Luscious Landscapes, Simple Techniques for Dynamic Quilts and my DVD, also published by C&T Publishing, celebrate my methods of creation and feature both my quilts and student work. Quilting Arts Magazine- Fall 2004, Page 88, “Expand your Horizons – Landscape Techniques” by Joyce R. Becker. Seattle Magazine, August 1994, page 17, Putting the Pieces Together, text and quotes.